Baseball Friday: are sports naturally unfair? Good things are happening in baseball. So let's mess with the mojo and ask uncomfortable questions. 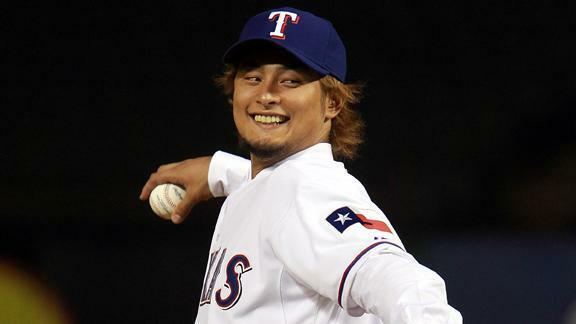 The Rangers' Yu Darvish is not a choker! Man, what great baseball we've been seeing lately. The Red Sox put a stake in the Yankees. Boston has clinched a playoff berth, while the Yankees fall three-and-a-half back in the wildcard race. Yanks hurler (and PED user) Andy Pettitte says he's quitting for good this time. He means it. Yes, the Pirates are for real. And Pos, of course, has a nice little post for the Royals. Of course, I don't want to talk about any of this. (Although I kinda just did – did you see that?) Instead I want to talk about...PEDs! Sure, I've talked about PEDs before. A lot. I don't know why, exactly. It's the biggest story in the sport, perhaps – after all, in a recent ESPN poll, fans said Alex Rodriguez is the "face of the game." Or maybe because it touches on aspects of the game I find interesting, its commentary, interpretation, the bizarre twists in law and rule and etc & co. Anyway, Malcolm Gladwell wrote a provocative essay for The New Yorker on PEDs and natural advantages in sports, and kind of throws into questions our objections to PEDs or other means of cheating – especially cycling's blood doping. To wit: Gladwell wonders why the lines are drawn where they are for PEDs and blood doping, when Nature gives some athletes an unfair advantage, and we use science – Lasik surgery, say, or Tommy John surgery – to give others a physical boost. So...why do we react to strongly to PEDs? And there's an implicit statement here, that our professional sports teams are filled with genetic freaks. Three-hundred pound lineman. Seven footers. Cross country skiers with a rare blood condition. That bit got the attention of Baseball Prospectus' Sam Miller and Ben Lindbergh, who posed the question in their "Effectively Wild" podcast (now my favorite baseball podcast) after reading Gladwell's piece, if baseball players are generic freaks, that will and work and practice and baseball smarts matter so little, why watch the games? I have to admit, I don't watch the NBA because I can't get past the fact that the sport is dominated by freaks. Height is everything in the sport. That said, I don't feel that way about baseball, or other sports. The genetic marvels that come along – the Mike Trouts, say – are fun to watch. Tom Brady throwing a football. Usain Bolt running the hundred. It's like reading a good poem or watching stellar television – Breaking Bad! – not caring that there are people far, far more talented than I, gifted with the wit, intelligence and drive to make good art. Still, you watch ballplayers who play the game right – who hustle to first on groundballs, who appreciate where they're at and how lucky they are, who approach fans with humility – and maybe they're undersized, and you know they'll never star in MLB...and, well, that's kind of a bummer.